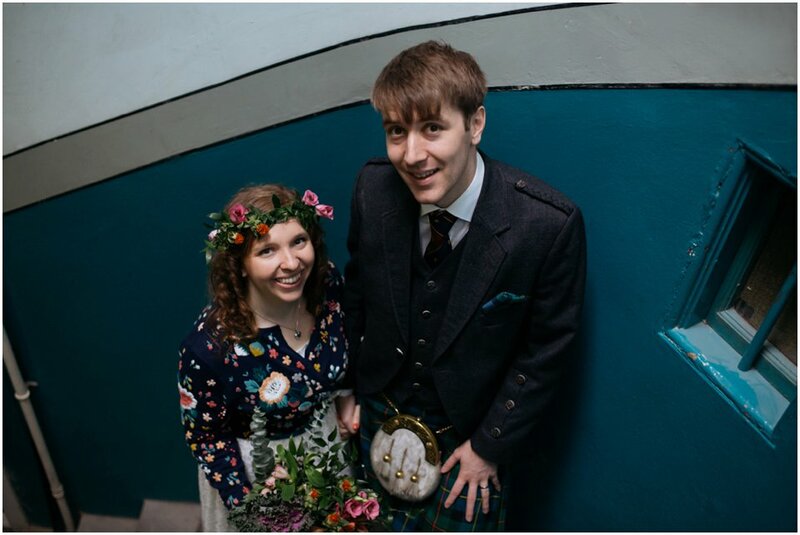 After hearing about Clare and Chris’s wedding plans over coffee and cake at their gorgeous cottage and seeing her stunning hand illustrated save the date cards and invitations it was no surprise that their wedding was going to be a stunner. 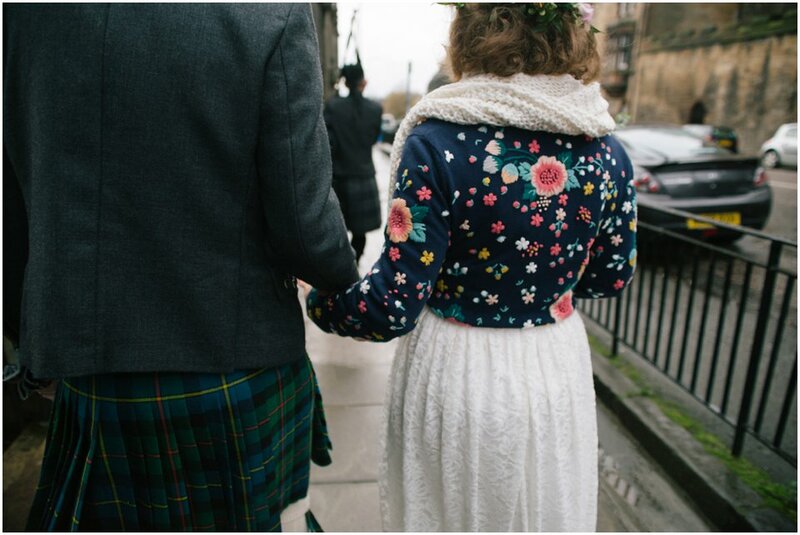 They are honestly the sweetest couple I have met and their engagement shoot last summer made me aww a lot. 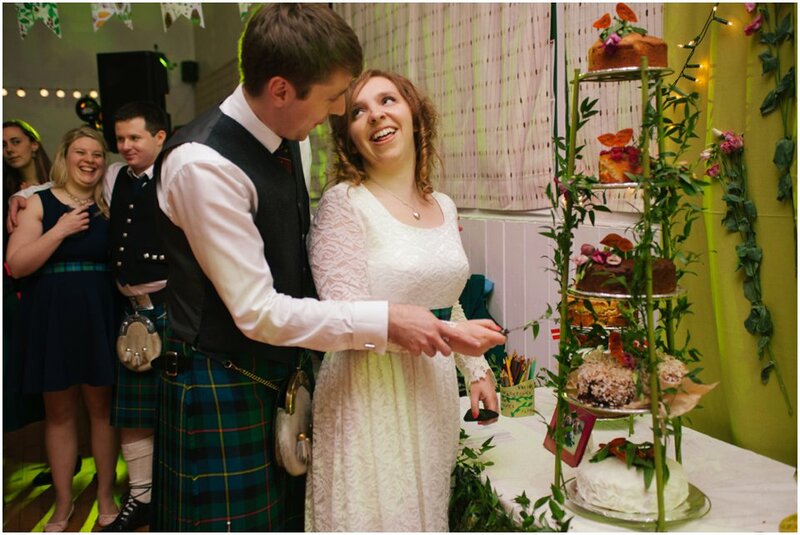 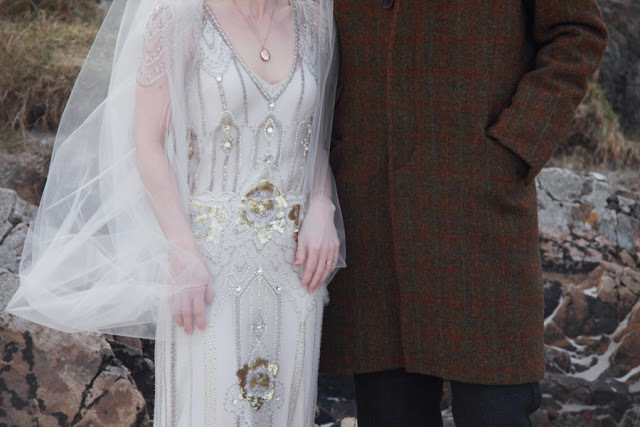 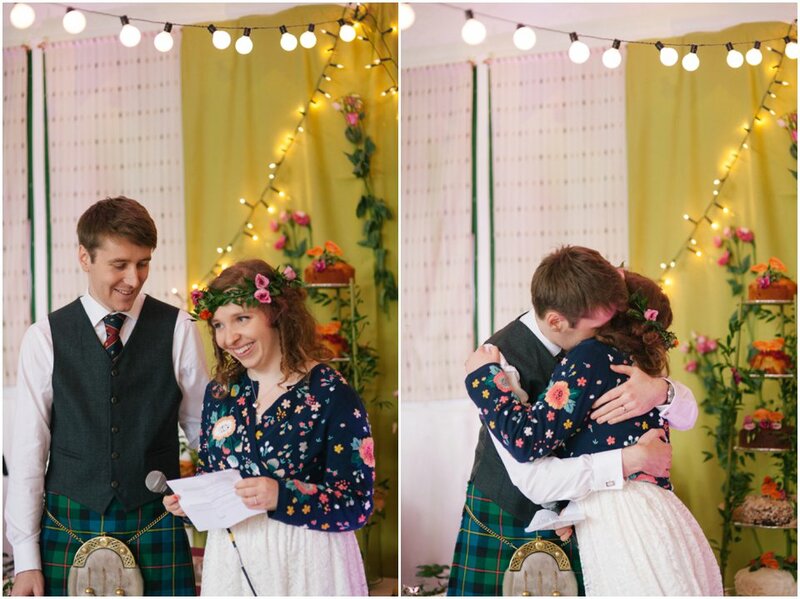 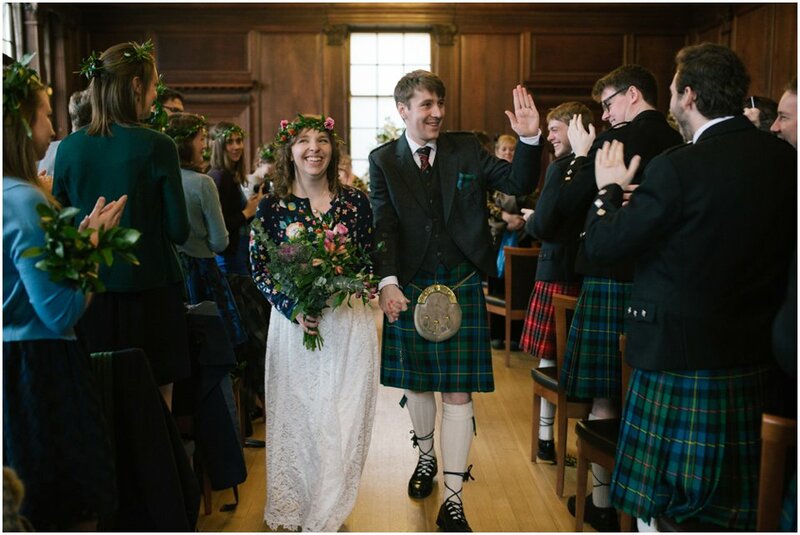 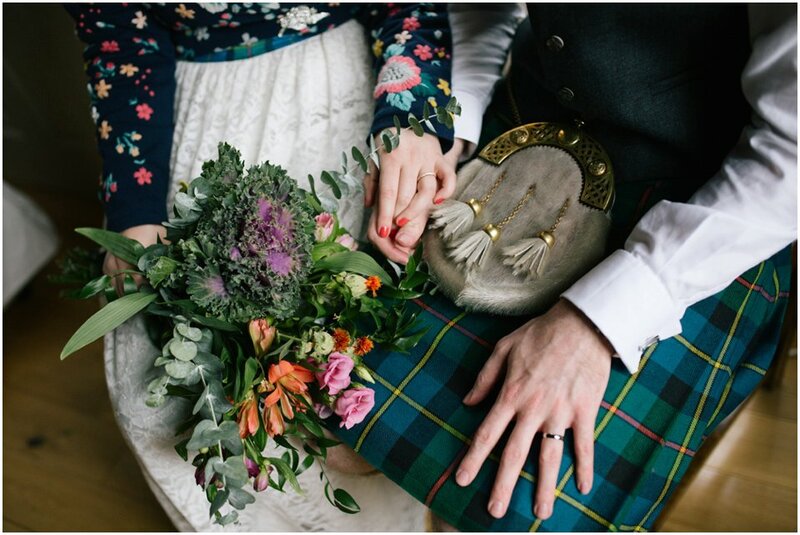 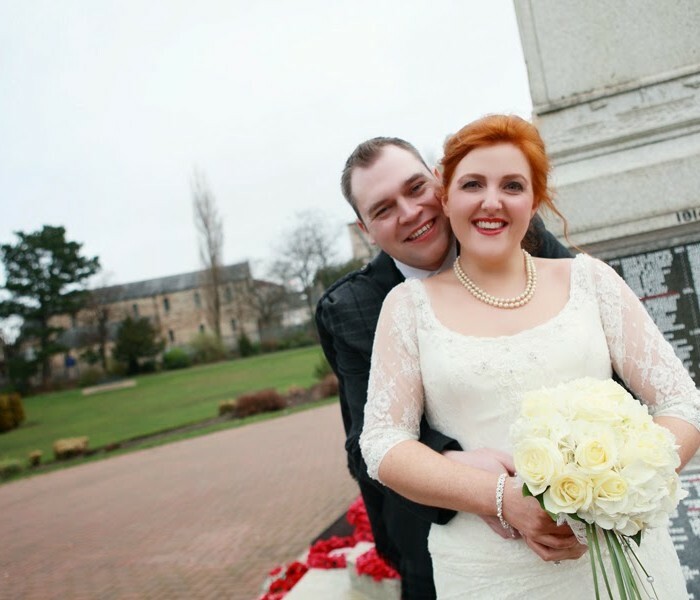 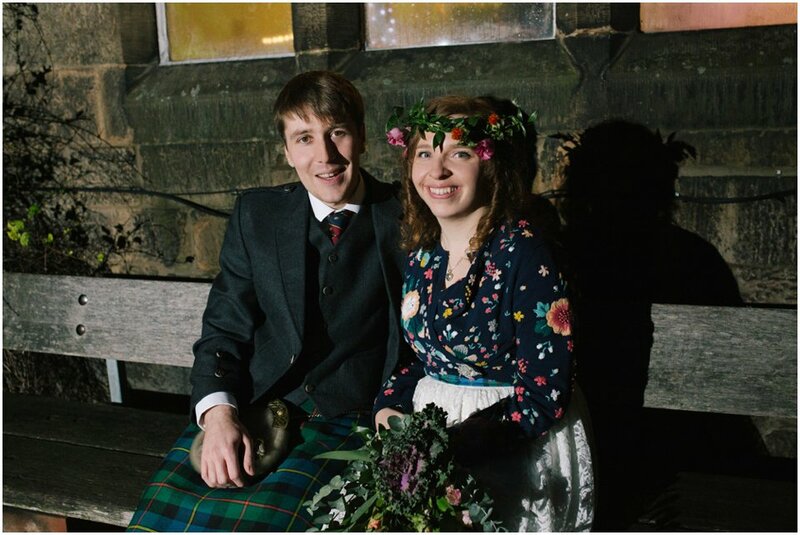 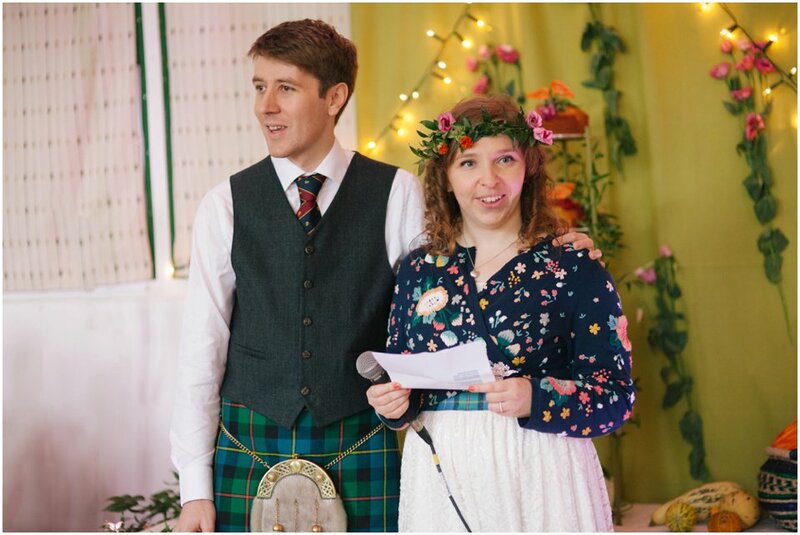 They met at Uni in St Andrews in 2007 and became friends they started holding hands at a Karl Kennedy concert during a cover of “Livin’ On A Prayer” and the rest was history choosing an early winter wedding in November 2015. 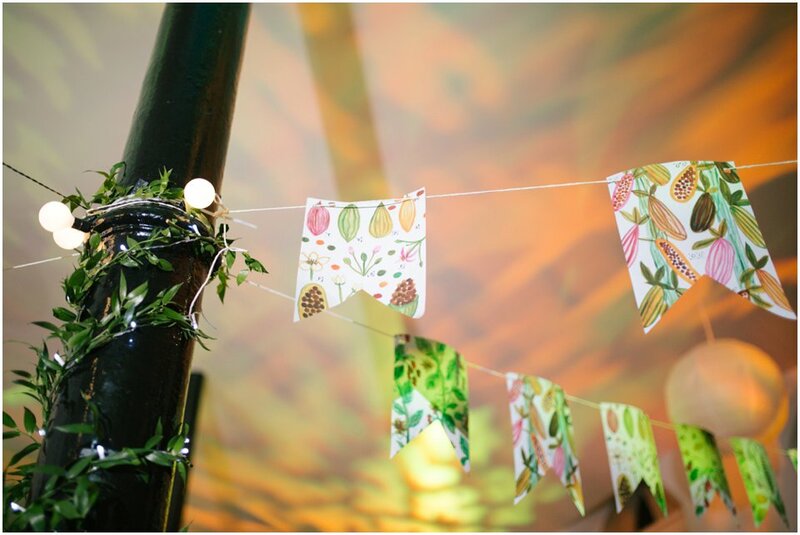 The hand illustrated florals from the incitations carried across the decor at St. Columbus when I went in during the morning take some detail shots. 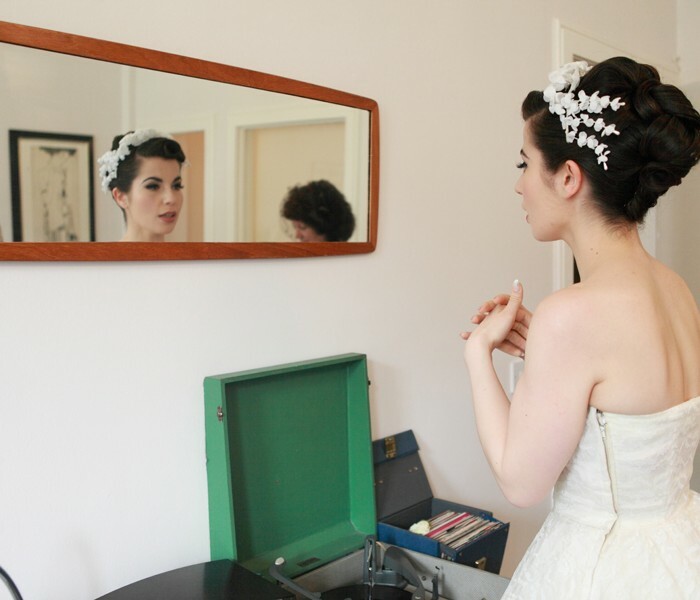 I walked into the room and went ‘ WOW’. 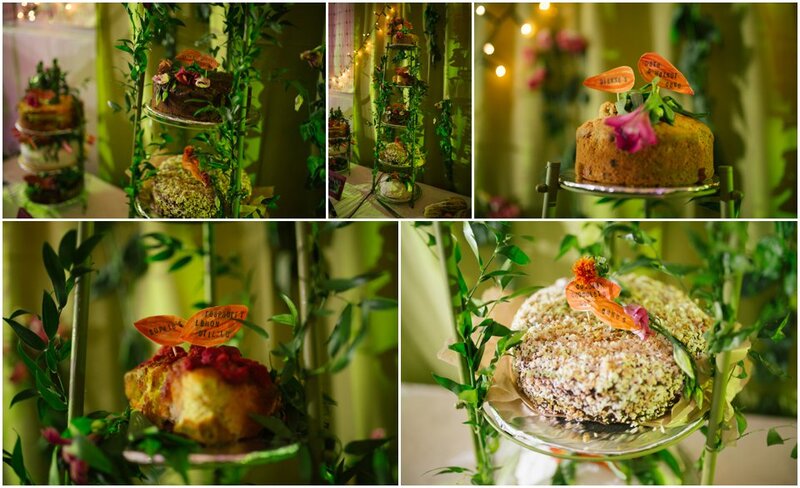 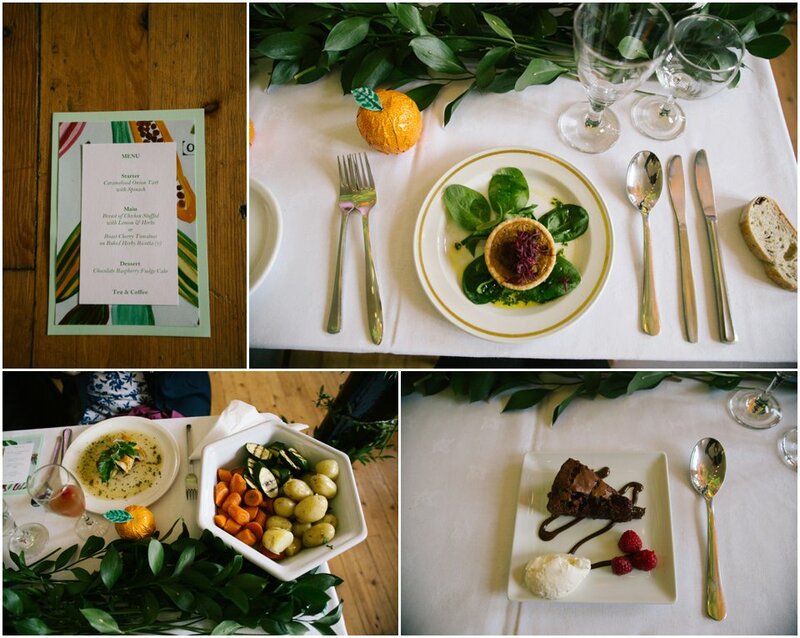 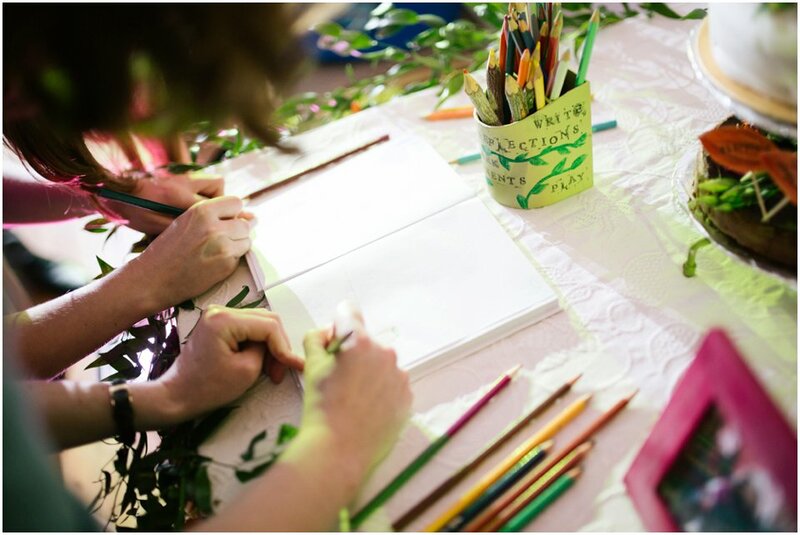 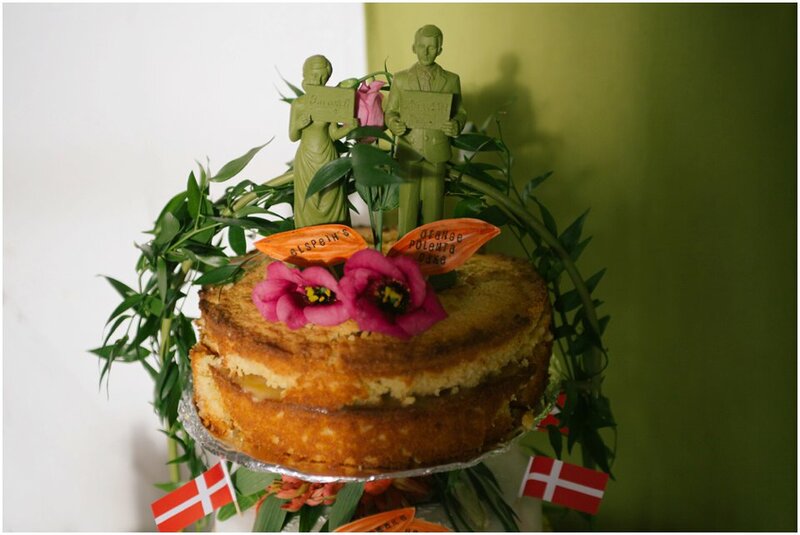 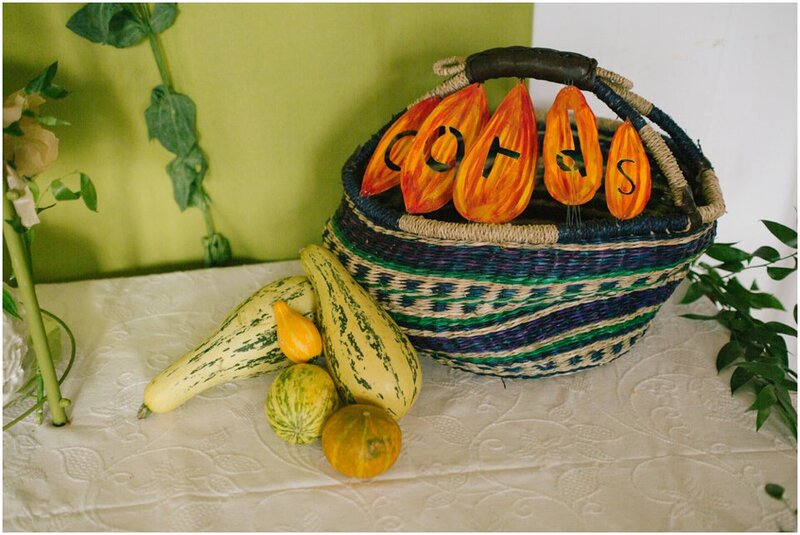 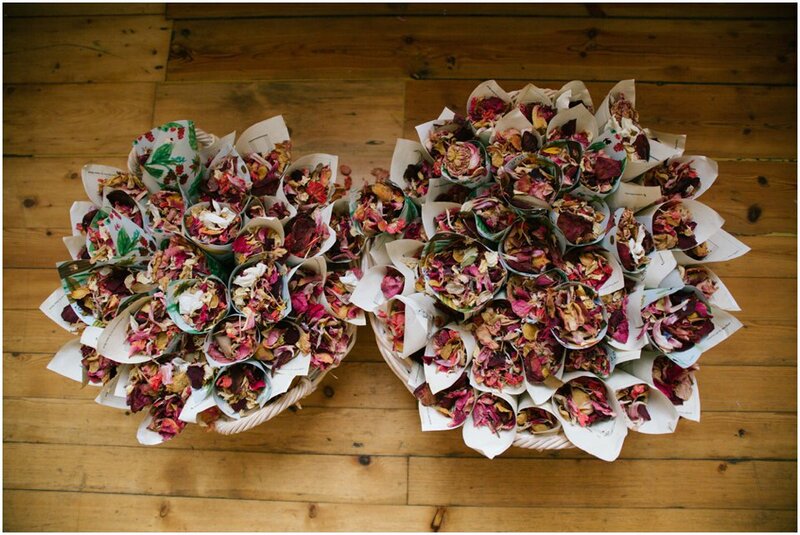 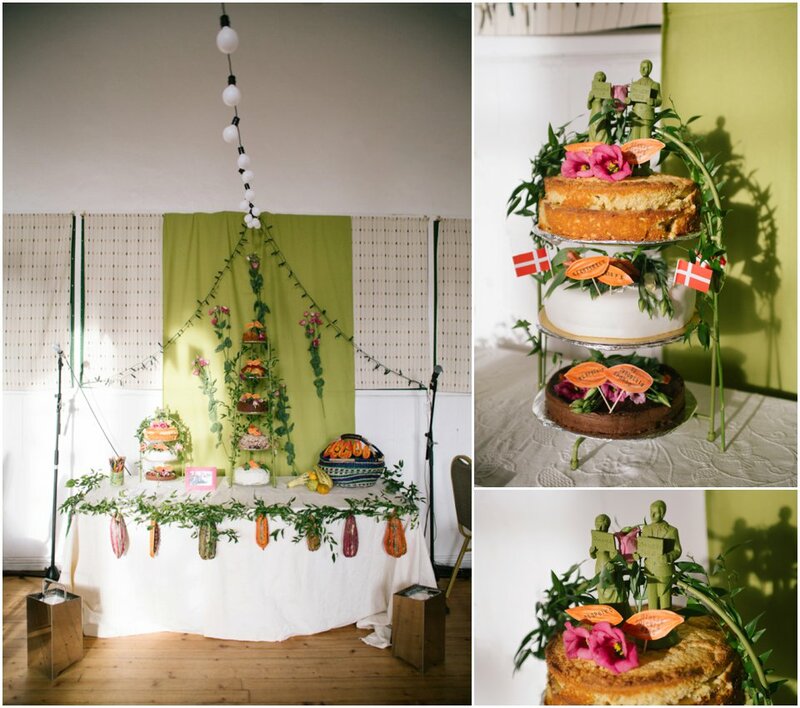 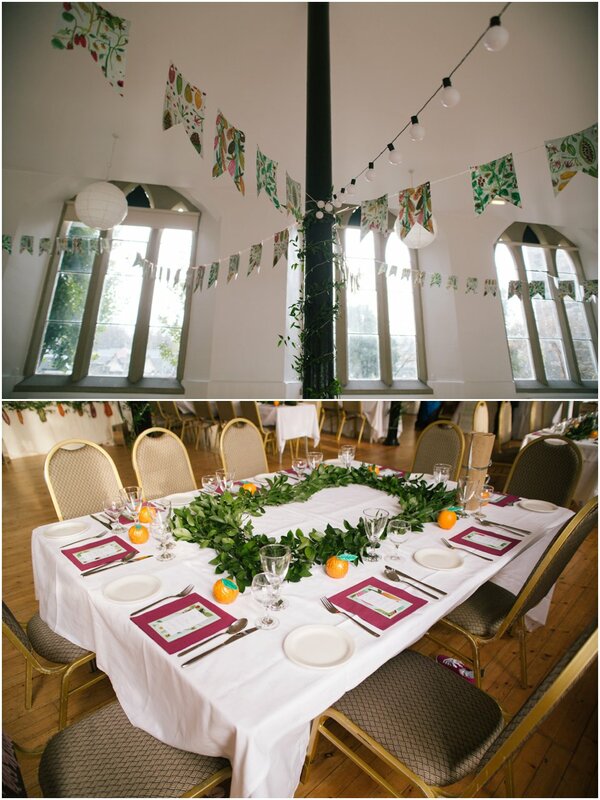 The table plan, bunting, table decor, cakes, juice bar, confetti cones and menus all carried on the theme showing Clare’s very creative personality. 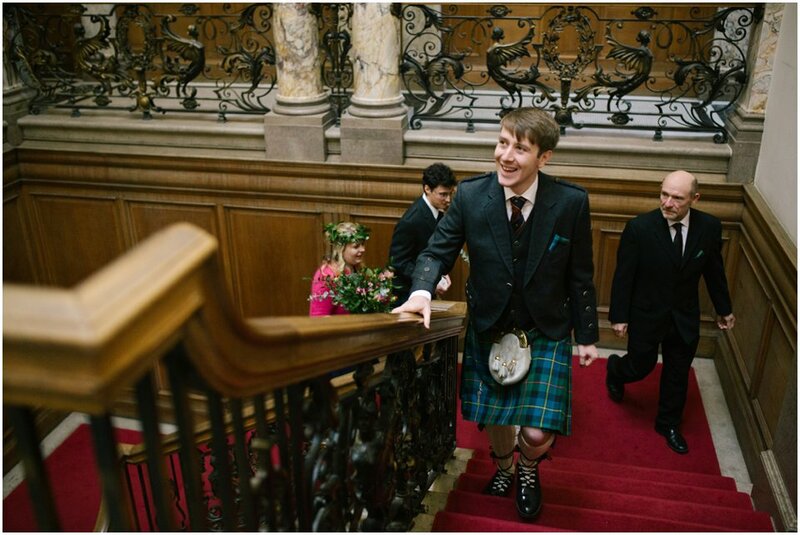 Their ceremony was held at the Edinburgh Suite at Lothian Chambers which I adore with the gorgeous wood panels in the room. 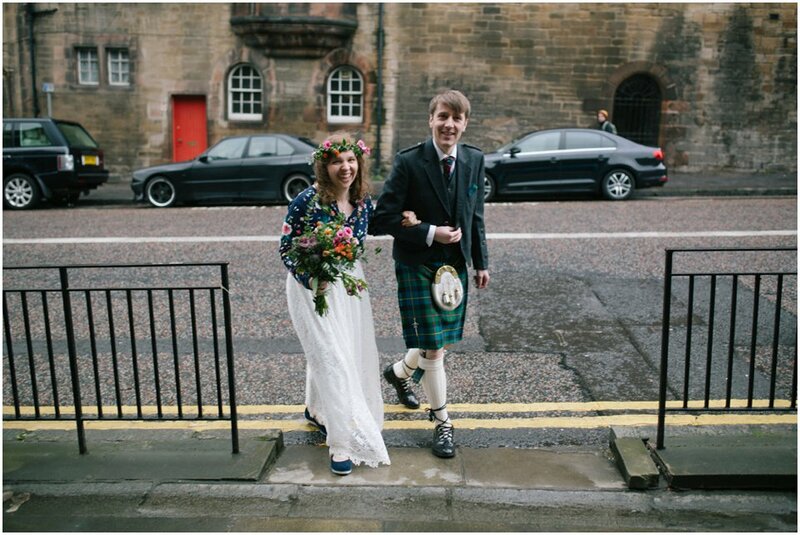 Clare and Chris met outside Lothian Chambers and walked down the isle alongside Clare’s dad under an arch of branches. 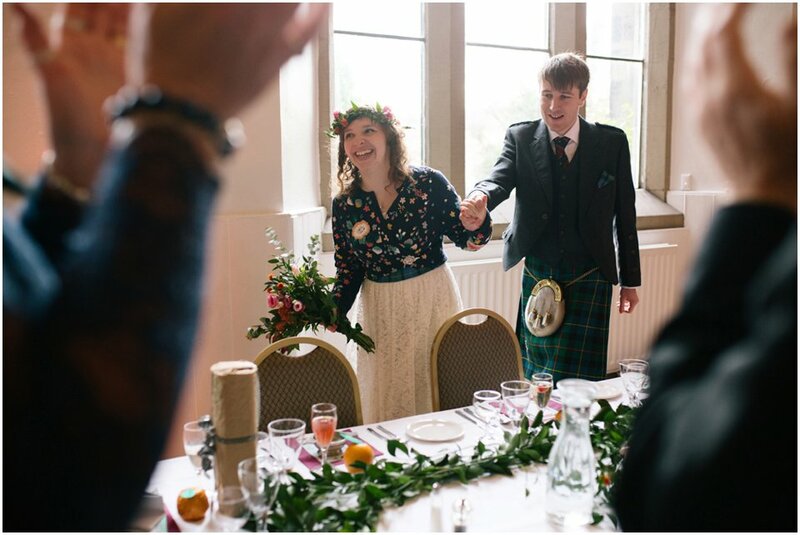 I loved Clare’s unique choice of flowers with the floral cabbage within the bunch. 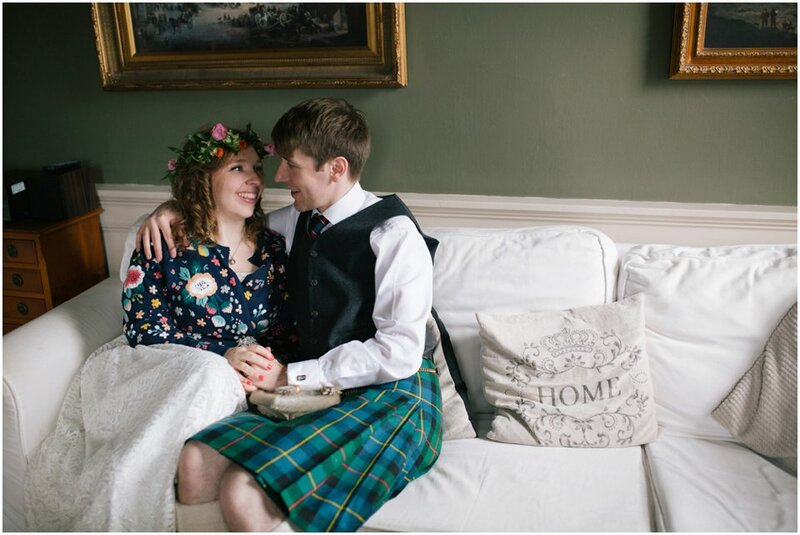 We chose to do their couple portraits inside their apartment overlooking the castle which they had hired for themselves and the wedding party for a couple of nights. 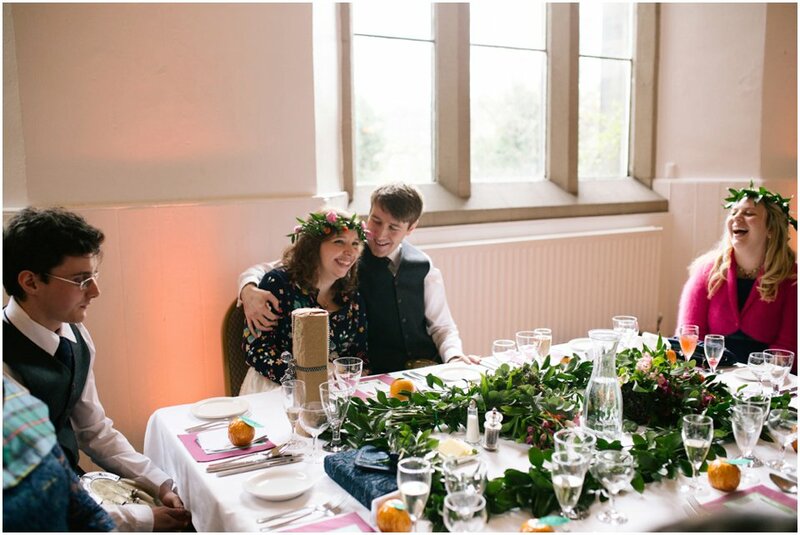 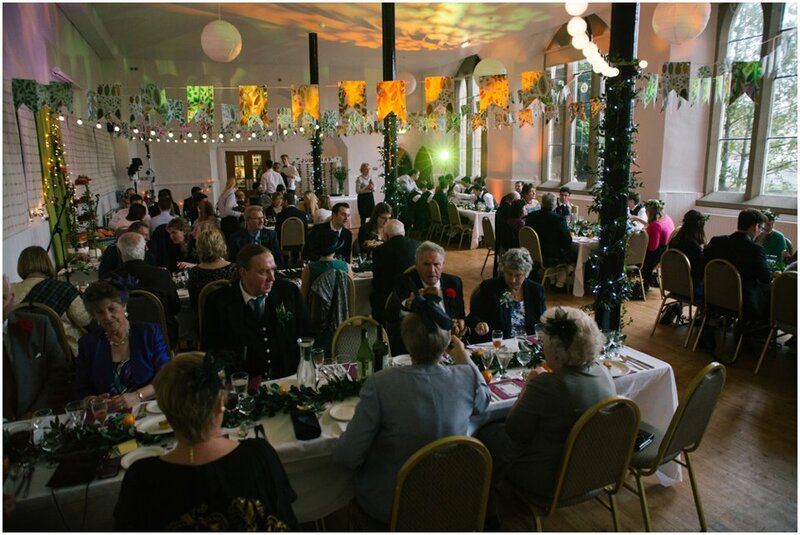 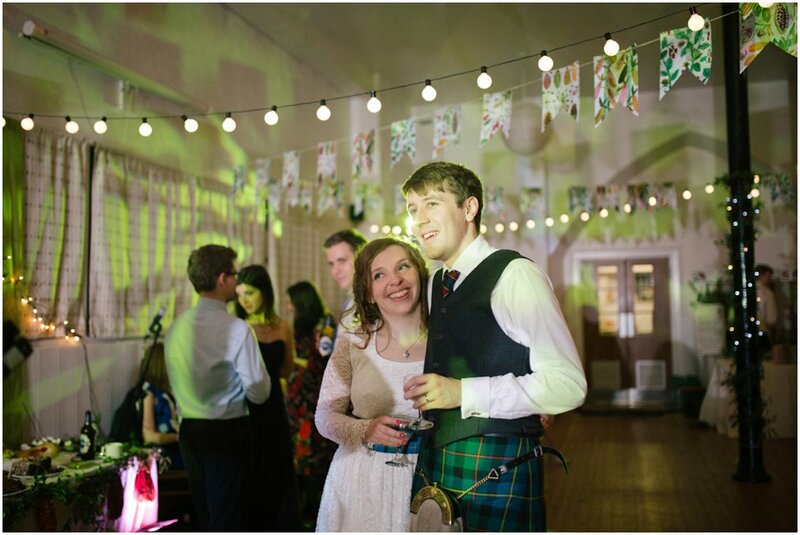 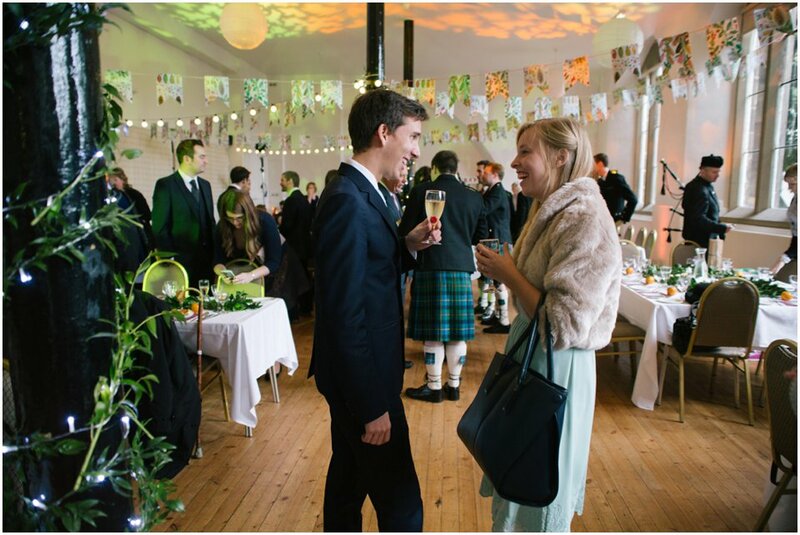 The reception room looked even more spectacular in the evening with the festoon lights lit and the coloured up lights and lighting with a leaf like effect perfectly complimenting Clare’s creative decor and room styling. 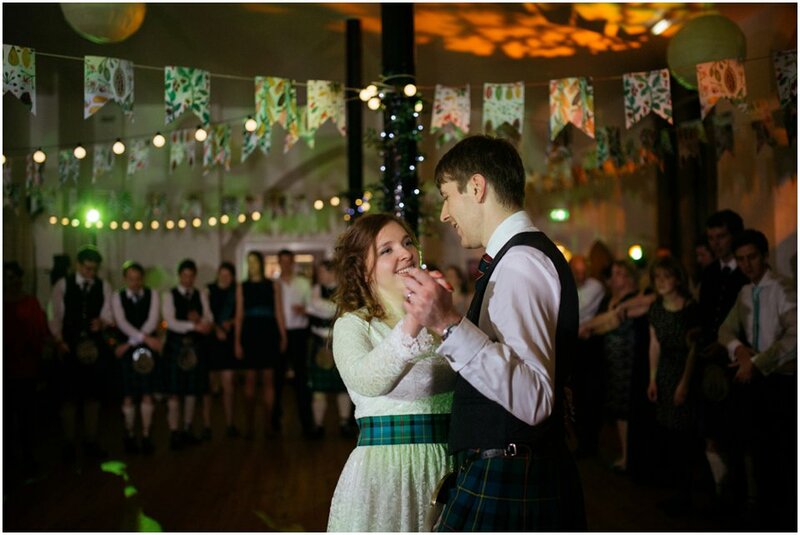 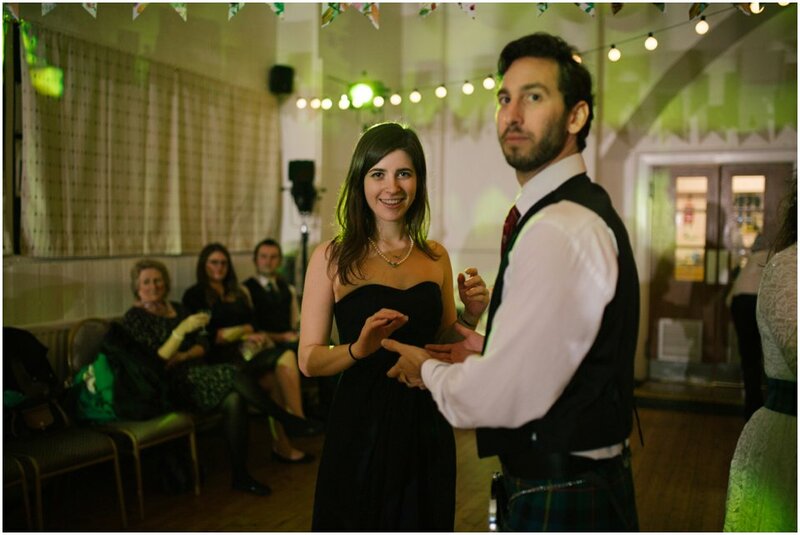 They finished the evening with a ceilidh and old lang syne which was the perfect end to my last wedding of 2015. 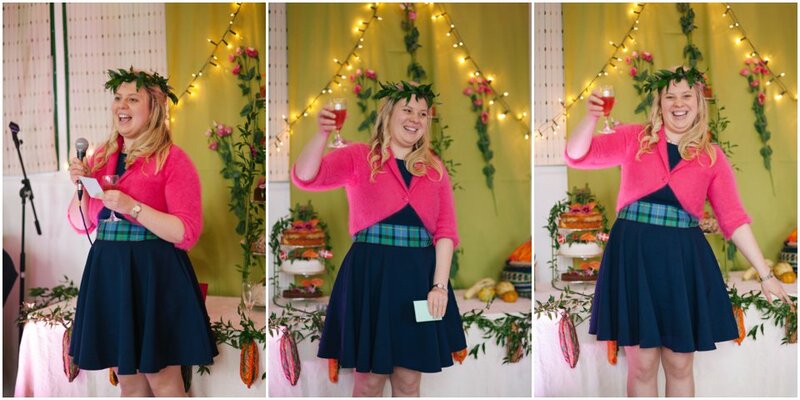 The quests partied the night away to a DIY disco! 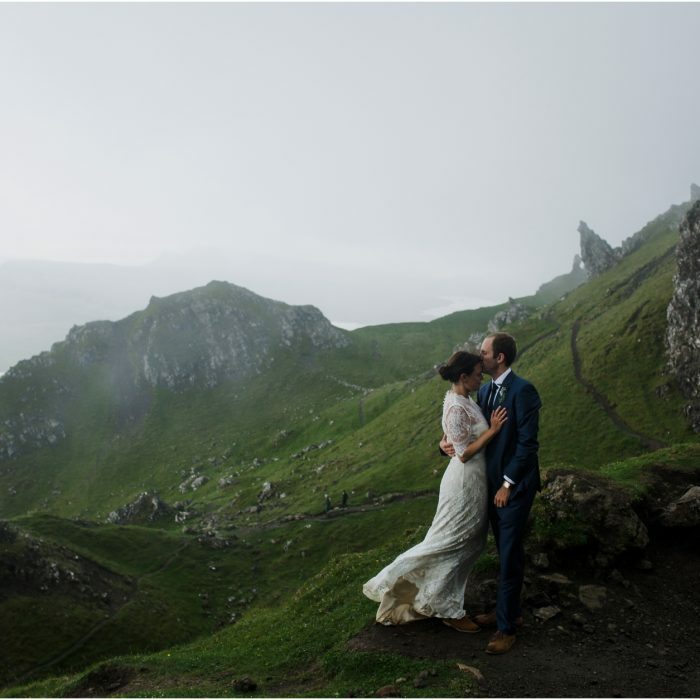 I think you will agree that the day was simply stunning and complimented them as a couple perfectly.